Hunter Pence is one of baseball's more colorful characters. And despite what the stadium signs might suggest, he has a lot of fans too. Combine the two and you've got a recipe for interesting bobbleheads. The latest Hunter Pence bobblehead giveaway has the outfielder making his fence catch in the series-clinching game against the Washington Nationals in 2014 playoffs. The San Francisco Giants gave the Hunter Pence Fence Catch bobblehead away at their May 9 game, a 6-2 loss to the Miami Marlins. The first 40,000 fans to show up for the game at AT&T Park got one of the figures. It shows an outstretched Pence, complete with tongue out, jumping to make the catch. The ball came off the bat of Jayson Werth in the sixth inning in what became the deciding game of the series. 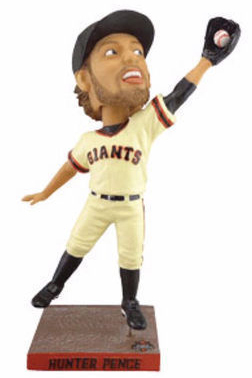 This is one of several post-season themed bobblehead giveaways planned by the Giants this year. They already handed out Madison Bumgarner bobbleheads in April with the pitcher showing off both his NLCS and World Series MVP trophies. On May 19, the team has a special Travis Ishikawa soundchip bobblehead giveaway in conjunction with their Japanese Heritage Night. This is the second Hunter Pence bobblehead stadium giveaway in as many years. Last year, the Giants had one of the outfielder riding his scooter. San Francisco Giants Hunter Pence Solar Bobble Body 2016. New In Box! Hunter Pence Solor Bobble Body-New Still In Original Box!!! !